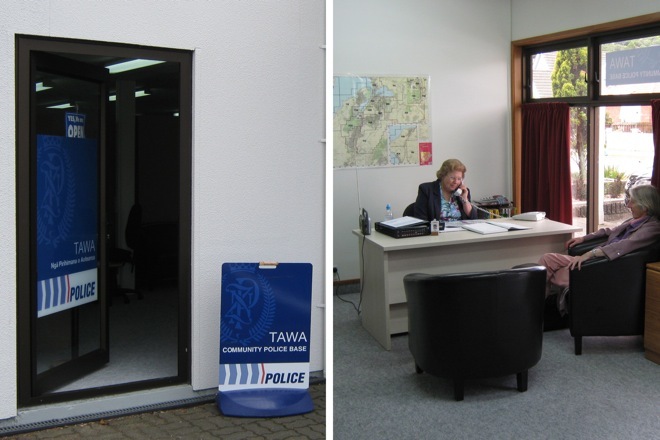 The Tawa Police Base is now (since January 2011) located at the western end of the Community Centre building at 5 Cambridge St, Tawa, between the Mervyn Kemp Library (on the Main Road corner) and Woolworths supermarket. See map of central Tawa. The police base is manned by volunteers on weekdays from 10am to 4pm and handles non-urgent matters. The phone number during those hours is 232 3160. Otherwise call the Porirua Police on 238 1400. Of course the number to call in an emergency is 111.